Don't just focus on what's hatching! Whether that’s true or not, the point is that on pressured rivers the fish see popular flies daily. Try something unconventional, and be confident fishing it! Just because everyone else is fishing a fly doesn't always mean you should. Aside from being productive, there’s something almost mad scientist-esque about trying something unique. It can be exciting to fish a fly that shouldn't work, but then does. Catching trout in water that looks borderline unfishable also gets the blood going, and makes us anxious for more! Don't be deterred by comments like “You’re fishing there? !” while your indicator churns in white water. When another angler asks what you’ve been using, and the answer is an egg pattern when everyone else is focused on tiny baetis or caddis, take pride in knowing you’re being innovative on the trout stream. That's easy to do when you're the one catching fish! Trout are rising feverishly all around us as we stare hopelessly into a box of neatly organized dry flies. There have been no willing participants as our caddis, drake, and stonefly imitations have drifted on by without an ounce of attention given by the fish. It’s frustrating, and our flies or tippet often shoulder blame, but the truth is sometimes the fault lies with our identification of the bugs fish are feeding on. It’s much easier said than done, but a great tip to catch trout feeding on dries is to watch the way in which they are feeding. Are there violent splashes as the fish attack bugs? Is it a gentle sipping trout that looks calm and innocent? Perhaps there is no rhyme or reason at all, which can still yield clues. Or maybe the only clues we need are present by the bugs themselves! Different types of bugs will have different mannerisms as they hatch and go through their life stages. Most mayflies will sit perfectly still on the water to dry their wings before flying off into the bushes to mate. The poetic scene of tiny bugs dotting the water surface and gently gliding with the current often an indication of mayflies, and can thus alert anglers to use those imitations. If the bugs are erratically moving about with not true rhyme or reason, the insect in question is probably a caddis. Seeing insects skating on the surface moving upstream and downstream with no sense of direction should make us reach right for an Elk Hair Caddis. After watching the bugs, the next stop is to observe the trout! If fish are slashing about the surface with wreckless intent, caddis flies are most likely the bug of choice. A hatched caddis moves through the water column with greater speed than other insects, which results in trout “tracking” and attacking the bugs heading towards the surface. During a spinner fall (one of the more underrated life cycles to imitate) the fish might lazily take their time while eating their insect supper. After all, the spinners are dead or dying so there is little rush to get a meal before the bug flies away. Focus efforts during a spinner fall on back eddies and slower pools. The dead insects will congregate in these spots resulting in a trout smorgasbord that can produce great results. Aside from watching how the fish feed, each individual bug can physically quite different from one another. A mayfly will have a pair of upright wings while a stoneflies wing cover the body of the insect almost like a cape. A spinner has splayed out wings that go almost perpendicular to the trouts body. Those small differences can make all the difference in the world to an observant angler trying to capitalize on a short hatch window. By catching one and inspecting the physical characteristics, it’s probably to get some insight into what type of bug you’re dealing with and thus what fly to use. Note the size and color of a hatching insect. Those two factors dictate fly choice. There could be multiple bugs hatching at the same time! Try to discern which one is being keyed on the most by trout. Once the main hatch wanes, get ready for the spinner action that’s quick to ensue. When fishing a local stream, notice the weather patterns and water flow during a hatch. Odds are the hatch will recur on similar days during that brief window. This is why you’ll often see anglers jumping in the air trying to catch insects flying around the stream. Information that can be gained from close inspection of a hatching bug can do tremendous things for the fly fisher, as can careful observation of the the manner in which the fish are eating. Use these proven tips to identify the bugs, and enjoy more productive fishing! Categories: How to Fly Fish, What's Hatching? Spend an extra minute pumping a caught trout's stomach to see what they have been snacking on. 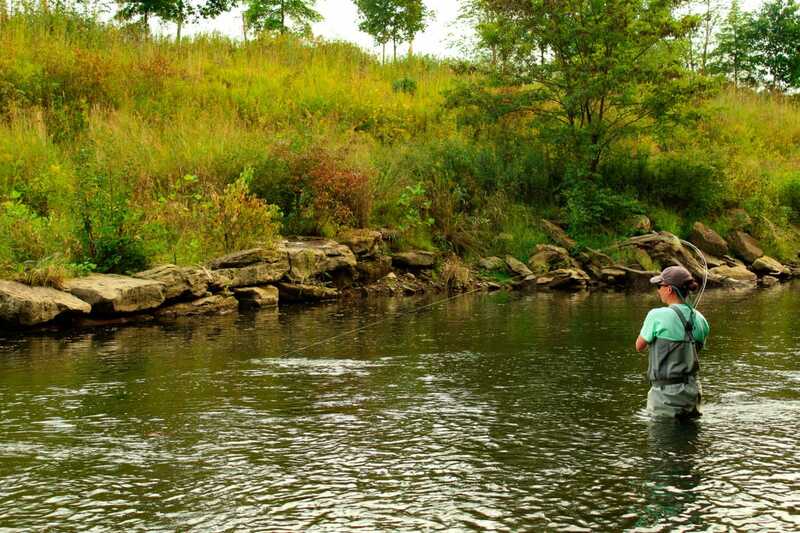 Anglers of all skill levels can relate to the helpless feeling of dealing with picky trout. As we sit there and stare holes in our fly boxes searching for answers to this fish riddle, it’s important to remember that sometimes the solution lies outside of our fly choice! There are instances when we might be fishing the right fly in the right location and our drifts still don’t produce fish. So what then? Screen the water for signs of what may be hatching and what trout may be feeding on. Consider a 'Masking Hatch' if there are obvious rises to (emerger, dun, or adult) insects, but nothing is taking your fly. Masking Hatches are when there are multiple hatches occurring but trout are only focusing on one. Give it a twitch. Sometimes all that is lacking is a little movement. Just a slight twitch is all that is need to get the strike, especially is slack water. 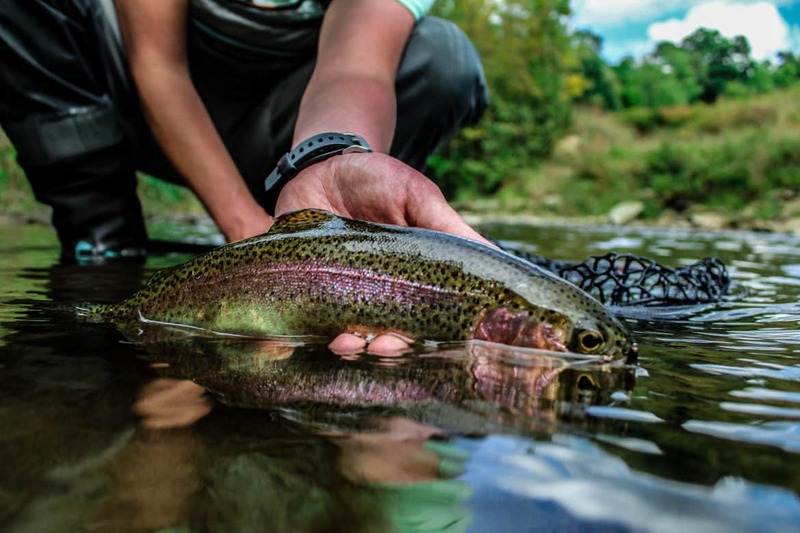 Are trout chasing your streamers with no success? Give them an easier opportunity to eat a bunch of calories by moving less. Trying different retrieval speeds with varying pauses to give them a chance to take a swipe at a struggling baitfish. Study their feeding behavior to determine the presentation and fly pattern. Trout will take insects in certain ways that will guide you in selecting the appropriate flies and how to fish them. Splash: indicates they were chasing an emerging insect to the surface. For example, caddis and swimming mayflies. Gentle rings on the water with little disturbance: taking dying or dead insects off the surface like crippled emergers, egg depositing adults, or spinners. A slight disturbance on the water: taking nymphs just below the surface. Porpoising: taking duns or crippled insects off the surface. The classic rule that a good presentation catches more fish than the correct fly certainly has some validity. If a blanket sulphur hatch is enveloping the water, simply tying on a sulphur imitation isn’t quite enough to catch fish. Fishers must also be sure to deliver appropriate drifts through the fish lanes without causing too much disturbance to the feeding trout. Once a fish is in “feed mode” it’s simply a matter of presenting an offering with our presence not felt. Doing that consistently (which is easier said than done) will result in plenty of fish in the net. Let’s assume for a second that all of the above is being executed correctly. We’ve got the correct fly, in the right spot, and have successfully countlessly drifted past a trout who continues to ignore our flies. One strategy is to try something totally unconventional. 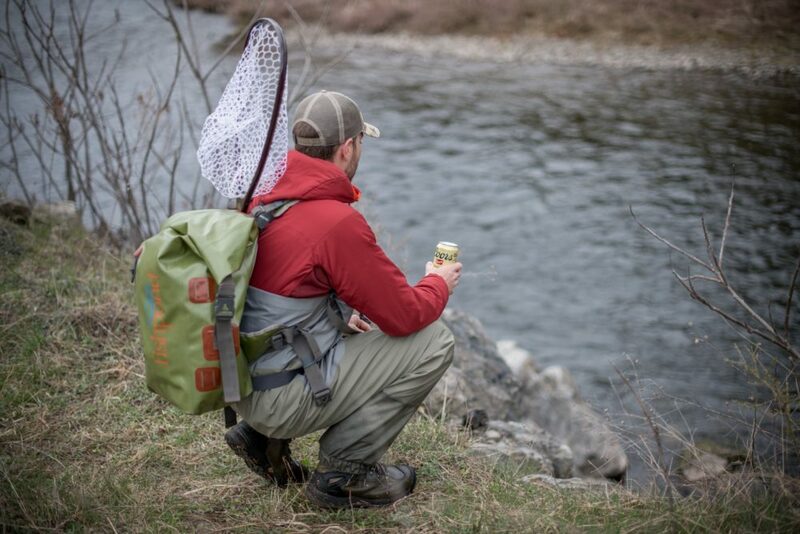 Throw caution to the wind and disregard everything you’ve ever learned about fly fishing! This can mean throwing a fly that has no business of working in the given situation. Trout sipping mayflies or midges and ignoring my dry fly is where this comes up most often. A common practice of mine is to throw large nymphs suspended about a foot under a small indicator. If fish are actively feeding on the surface, I know they are either in the upper water columns or at the very least looking in that direction. When fish are in serious feed mode, it’s possible to get away with throwing some patterns that are a bit outlandish. Once during a steady stream of BWO’s I decided 30 minutes of refusals was enough so I tied on a size #10 prince and dropped it 18 inches under a pinch-on indicator. Fish started responding immediately and the action was hot and heavy for the duration of the hatch. It isn’t just about fly choice when the trout get picky. Presentation is equally paramount to success, and if all else fails unconventional imitations can change the entire day. Just because a fish is feeding on adult caddisflies doesn’t mean that is the only thing they will eat. Sometimes fortune favors the bold, which is something to remember the next time you’re staring at that hole through a box of dries! The elation of watching a good fish hit the net is difficult to explain to non-fishing folks. Conversely, few things match the hurt of a tight line suddenly going limp as a solid trout swims back into it's home unaware of the pain felt by the angler just a few feet away. Don’t let people fool you when they say they never mind if a hooked fish doesn’t hit the net. In some cases that might be true, but when a great fish is hooked anglers want to land it. The secret to increased hooked-to-landed ratio often times starts in the hookset. Most nymph and dry fly drifts will start upstream and work their way back towards us. This can be used to our advantage when looking at a solid hookset that will land more fish. In typical cases, trout are facing upstream waiting for bugs and other foodstuffs to float past. That’s why we cast upstream and allow our flies to drift down, but it also aides in a hookset that will wrangle in more fish. When a fish strikes, a quick jerk downstream is the best type of hookset to keep fish buttoned during the fight. If the hookset is executed correctly, it’s the perfect angle to successfully lodge the flies in the corner of a fishes mouth. At this point, it’s all about maintaining proper tension on the line while slowly and methodically bringing the fish closer to the net! Another hookset strategy to land more fish can be the multiple set rule. It’s something that’s employed more frequently using large streamers for toothy predators, but it can also be utilized for trout. After a fish is hooked, give a second or third more subtle hookset just to ensure the hooks are firmly entrenched. It’s important not to apply too much pressure, as this can result in snapped flies or line, but a secondary hookset can convert poorly hooked trout into more fish in the net. Lost fish are a part of life for anglers, but it still hurts each time we go from the high of a hooked trout to the disappointment of slack line. A solid hookset can be the first step towards minimizing this situation, whether that be the sharp jerk downstream of a secondary hookset once the fish is hooked. While visions of brown trout slurping dry flies frequent our dreams, the truth is fishing subsurface flies will yield better catch rates most of the year. If anglers are serious about catching fish, they will do everything they can to increase the odds of success! That often means using multiple flies on one rig to show the fish different looks and different bug imitations. As everyone starts to shake off cabin fever and think about the upcoming trout season, keep these five duo nymph rigs in mind. If there is even the slightest chance a fish is spawning in a stream (trout, chub, sucker, etc.) you’ll catch trout using egg patterns! Pound for pound eggs have more protein than just about anything else in a fish’s diet, so it’s only natural a few flies should be in our box at all times. Is there a more classic nymph than the prince? As fly fishing trends have come and gone one of the few patterns to withstand the test of time is the prince. It works everywhere and anywhere trout live and that’s why it’s a surefire choice to be highlighted on one of the top nymph rigs. This tandem rig is one to have at the ready year-round. Underwater action from the squirmy worm material drives trout absolutely bonkers. This fly will catch native brookies, wary spring creek trout, and stocked fish alike. When it comes to attractor nymphs, the CDC PT is one of the best. It can serve as a passable imitation for stoneflies, mayflies, and midges on its way to catching plenty of trout. This nymph setup is one of the go-tos for new water where hatch charts and fish behavior might be an unknown. Fish these flies with confidence as you observe what else is going on and what the trout might be keying on that particular day. A new take on a timeless pattern is the king prince. In a time when curved and jigged hooks are all the rage, the slight bended shank has turned the prince into a deadly trout catching machine. When fish are being a bit particular and the original prince isn’t doing the trick, the king prince might be the ticket. A fly that is a bit more obscure from the historical spotlight is the sparkle wing RS2. Its cousin, the copper ribbed RS2, gets more of the fame and notoriety but it shouldn’t! The sparkle wing in olive or grey can produce big numbers when midges are coming off. It’s also a great choice for Trico imitations when used in smaller sizes. The thin profile and tungsten head of the rainbow warrior makes it an excellent fly for skinny water. When fish are hugging the bottom, the sooner our flies reach the target zone the better. Often times that can mean using multiple split shot even when fishing spots that are slow, so the tungsten head can help avoid needing to add so much extra weight. As far as trailing flies go, the WD-40 gets the job done better than most. The beauty of this fly is its lightness can result in a certain level of free-floating that makes the trout go crazy for it! One of the hardest things to determine is what level of the water column trout are feeding in, so having a fly bounce around through multiple layers can be quite beneficial. The Cadillac of nymph rigs. Neither fly is often used or highly touted, but each one flat out produces. While most “top fly” lists stick to more mainstream patterns these ones are equally if not more productive. Tie on this rig with confidence for spring creek and freestone fishing alike. Using the copper ribbed RS2 and zebra midge in tandem can be exceptionally effective during winter months when midges reign supreme and during mid-summer when wary trout have shut off from larger flies. Tie these two patterns on and be sure to have the net ready! It’s the future of content consumption! Americans are devouring podcasts in record numbers, and the fly fishing community is no different! The ability to get our fishing fix, or learn about fly fishing, at the gym or on our morning commute changes the game entirely. There are plenty of worthy “pods” out there but below are a few favorites that anglers should download and try out. One of the best out there is The Drake magazine’s podcast with host Elliot Adler. It’s part fly fishing, part conservation, and part culture in nature as they take listeners around the country in pursuit of fish and the stories that come with them. Episodes featuring Hank Patterson, updates on forest fires, and life on bonefish flats ensure that there’s something for everyone on this hit podcast. A dose of live, from-the-boat interviews give The DrakeCast an edge and uniqueness not found many places elsewhere. Host Tom Rosenbauer is a legend in the fly fishing world and he brings some serious star power to The Orvis Fly Fishing Guide Podcast. Most episodes are broken up into multiple segments, one featuring interviews with leading industry professionals, and another with listener questions answered with informative responses. It’s a great mix of entertainment and learning for anglers of all skill levels. Sadly, this podcast ended in October. The good news is there are over 70 past episodes still in the hopper and available to download! Host Tim Evans, a native of Casper, Wyoming, covers fly fishing for smallmouth, tarpon, trout, and everything in between. Pepper in interviews with Team USA Fly Fishing members, prominent artists, and expert guides and Fish On The Brain easily becomes a podcast listeners can churn through in no time! 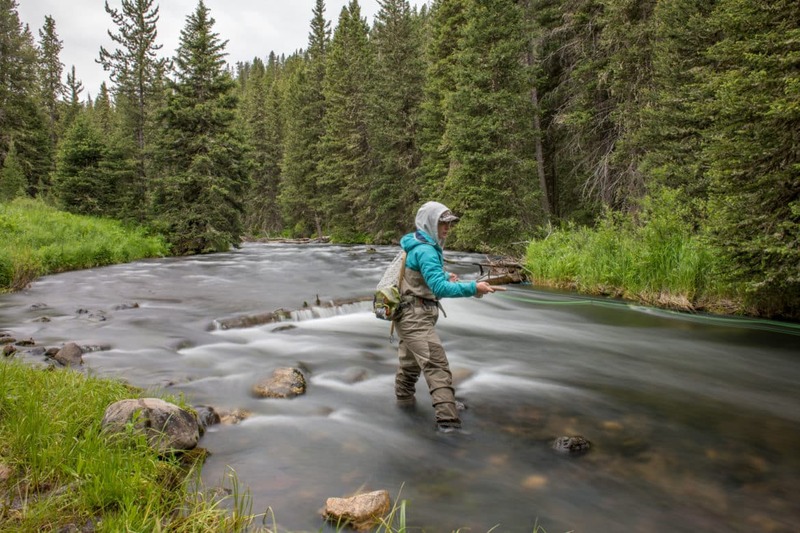 April Vokey is one of the most well-known and respected individuals in the fly fishing community. On Anchored, she has conversations with folks like Eva Shockey and Les Stroud discussing fishing but also larger outdoor issues like public land access and wild salmon returns. There isn’t much “how-to” in this one, but the entertaining interviews allow listeners the chance to learn more about professionals in the outdoor industry. Being multifaceted enough to have a conversation with Donald Trump, Jr. as well as Roland Martin makes Anchored a captivating listen. Interviews with guides, fantasizing about New Zealand brown trout, the art of tying flies, and gear reviews make up this up and coming pod. Mark Hopley, host extraordinaire, says “I started the podcast because I couldn’t find enough detailed information on fly tying, stillwater strategies, conversations with passionate people in the industry, and I was always looking for more to make my time on the water more productive and enjoyable.” He achieves these goals and then some in a show designed to share knowledge with listeners in a way that is inclusive to all while instilling a passion that is sure to grow the sport of fly fishing. Give these shows a listen, and it’ll be easy to understand why they are some of the hottest podcasts in the fly fishing world. There’s plenty of knowledge to gained, laughs to be had, and fish to be dreamed about. All that’s needed is a download for a morning commute or a jog at the gym! Forget about going to the gym or eating better; let's talk about some New Year's resolutions that really matter. That's right, we are talking resolutions of the fishing variety! There's always room to improve as an angler and expand the scope of your fishing prowess, so follow these 5 resolutions and fish your way to a better you in 2019! Duh, right? It's true though! Often times throughout the year we will look at the stream gauges, weather, or recent trip reports and decide to stay at home. Change that habit with the ringing in of the New Year! If the water is high, go fish! Ask yourself this, would you rather write the fishing report or read the fishing report? It's amazing how productive the days have been when going out or staying home was a coin flip. Spend more days on the water this year; you'll be glad you did! Last year I made the effort to target musky and pike on the fly rod. Was it an excuse to buy cool flies and a boat? Who can know, but man was it fun! Going after a new species of fish in 2019 will broaden your horizons and expand your fishing opportunities. It's a great way to be versatile and ensure that there is always something fishing well whenever you have the itch to go out. Fly fishing is ever evolving, and as new techniques and methods come out our skill set must improve! A lot of times those new skills will either help us catch more fish, or help us catch fish in different water conditions. For example, learning to fish streamers will open up a whole world of opportunities for the fly angler, and will probably yield a few larger fish than the typical nymph angler is used to. The skill doesn't necessarily have to be on the water, though. Perhaps your 2019 skill to learn is tying your own flies, or learning new knots! This is one of my favorites! Taking the time to scout a new piece of water is very exciting. While these excursions are sometimes a bust, other trips to new water produce some real gems that become regulars in your fishing location rotation. If your new water is in Pennsylvania, the Pennsylvania Fish & Boat Commission has some excellent map resources to help narrow the search. Here's a link! Catching a fish on a fly rod is one of the most rewarding feelings. One of the few things better than that is watching someone you've taught catch a fish! Whether it's a friend, relative, spouse, or significant other take the time to show someone the merits and joys of fly fishing. The gratification felt upon seeing their interest in the sport is reason enough to have this one on the list of resolutions for 2019! While winter might not seem like the best time to be standing in water in pursuit of trout, our finned friends brave the cold and are there for taking to those hardy few willing to brave the elements. Tactics change with the season, however, and nowhere is that more apparent than in winter fly fishing pursuits. Going after trout in winter is all about angler comfort. This is the one time of year where it’s more important to think about ourselves first, and the fish second. If the fisher isn’t warm (a relative term in the frigid months) then he/she won’t be able to fish productively. Hand warmers, layers, wool gloves, a good hat, and a quality rain/winter jacket all go a long way in making a day on the water more enjoyable. Once the thought process turns away from “holy smokes this is the coldest I’ve ever been in my entire life,” efforts can be turned more towards the fish. Trout are basic creatures with basic functions. When it comes to eating, they must consume more calories than they expend. 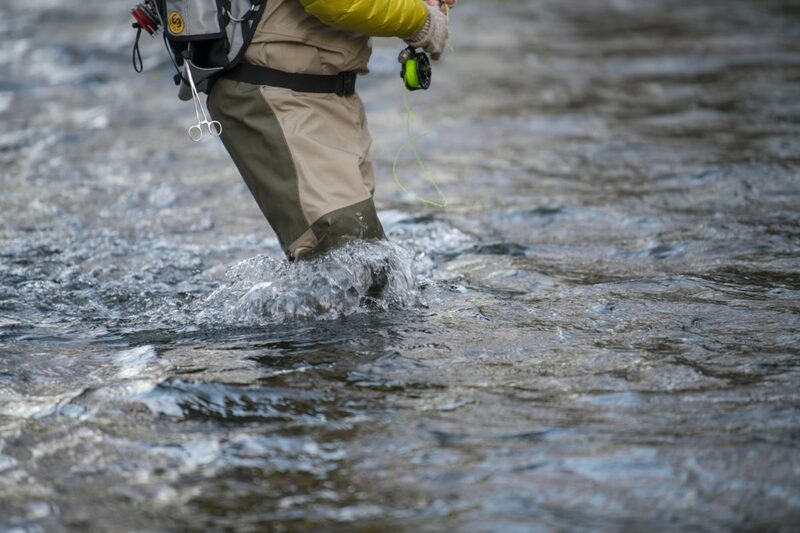 There are exceptions to rules, but typically a fish won’t move several feet to chase down a streamer or move far out of their holding lie for a nymph. The caloric equation just doesn’t make sense. 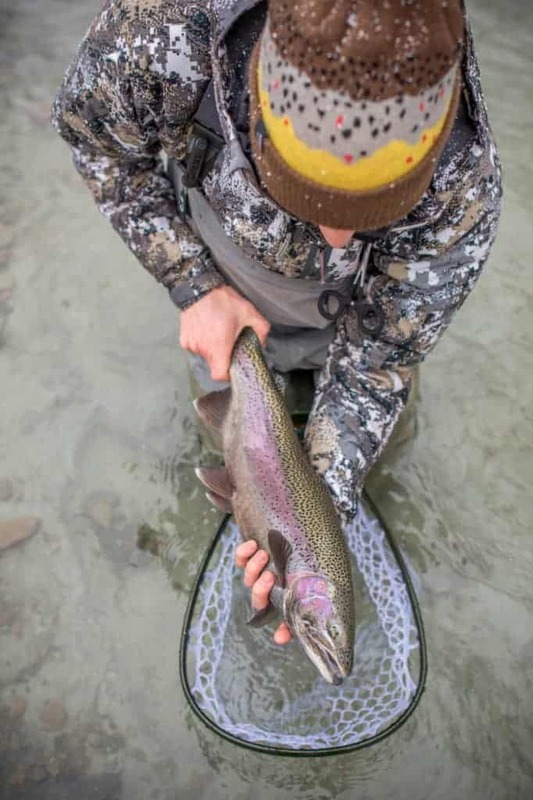 During cold winter months when the water is borderline ice, trout (like some humans) hunker down and try to ride things out until warmer weather returns. One of the more advantageous times to trout fish is when streams start to ice over, which seems strange. The truth is conditions like that tend to congregate fish together, typically in the deepest of pools. That means if we catch one fish, or even if we see a fish, more are sure to be present. Fly anglers who locate fish should drop anchor and prepare to spend some time methodically probing the area before moving on. “It’s always darkest before the dawn,” is a familiar phrase, but perhaps it should read, “it’s always darkest and coldest before the dawn.” Early winter mornings are bitingly frigid and ice on the streams becomes commonplace. Don’t wake up early in the name of duty only to find a favorite winter pool entombed under a sheet of ice, and the trout underneath untouchable. Sleep in a bit, take the dogs for a walk, have a hearty breakfast, and then go fishing. Starting the day at 10 AM instead of 7 AM can make all the difference in the world both to us and the fish. Allowing the sun’s rays to shine down even for an extra few hours can stimulate bug activity, and in turn feeding trout. “Match the hatch” is a phrase known by even the most novice of anglers, and it holds merit. It only makes sense to match our fly selection to the natural insects hatching. Despite the bugs being smaller when the weather is colder, it sometimes doesn’t hurt to throw larger flies. Remember a trout's life is all about consuming vs. expending calories, and after all their brain is the size of a pea. Throwing large prince nymphs in a #12 or bright colored San Juans should never work in relation to what natural bugs are present, but the fish will respond to them! Considering how cold the Lake Erie tributaries can get, “fever” is an interesting word to use to describe steelhead fishing. It’s an accurate description, however, as the insatiable urge to pursue these great fish grips anglers tight and refuses to relent. The trouble is that with each changing leaf and incoming autumn cold front, about 200,000 other fishers catch this same sickness, and it seems like they all descend upon the tributaries at the same time. Here are some helpful tips to ensure that fever doesn’t turn into a nightmare. Steelhead, much like all migratory fish, are either there or they aren’t. While that may seem fairly obvious, it’s important to remember when fishing for chromers. 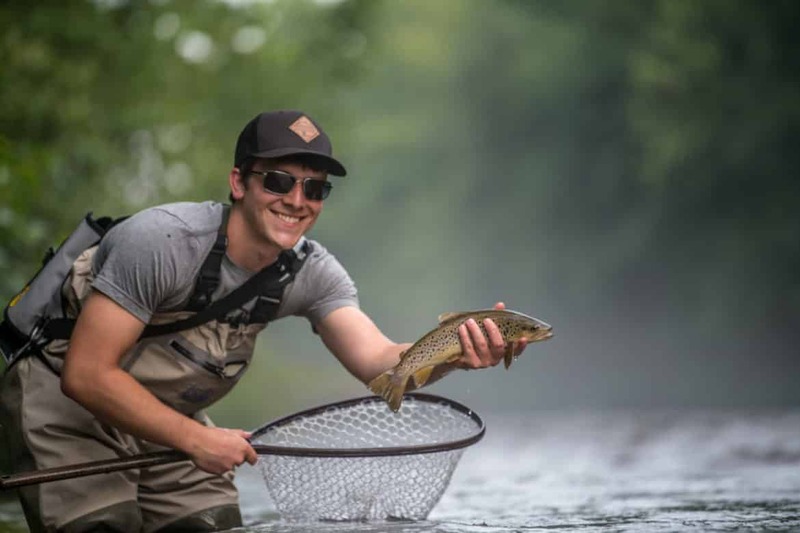 The tributaries (particularly the ones in PA) often run very low and gin clear, which can make for some difficult fishing conditions, but it can also do us a great service when locating the fish. It’s easy to tell whether the fish are holding in the riffles, runs, or pools you’re peering into. That isn’t to say the fish are always incredibly easy to spot, but it’s worth the extra few minutes observing the water to see if a fish shows itself before blindly throwing casts. Considering how cold the Lake Erie tributaries can get, “fever” is an interesting word to use to describe steelhead fishing. It’s an accurate description, however, as the insatiable urge to pursue these great fish grips anglers tight and refuses to relent. The trouble is that with each changing leaf and incoming autumn cold front, about 200,000 other fishers catch this same sickness, and it seems like they all descend upon the tributaries at the same time. Here are some helpful tips to ensure that fever doesn’t turn into a nightmare. Steelhead, much like all migratory fish, are either there or they aren’t. 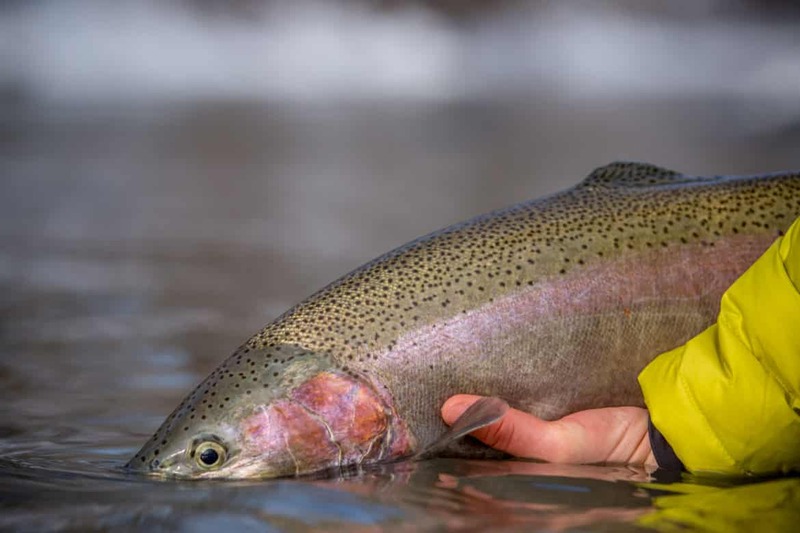 While that may seem fairly obvious, it’s important to remember when fishing for chromers. The tributaries (particularly the ones in PA) often run very low and gin clear, which can make for some difficult fishing conditions, but it can also do us a great service when locating the fish. It’s easy to tell whether the fish are holding in the riffles, runs, or pools you’re peering into. That isn’t to say the fish are always incredibly easy to spot, but it’s worth the extra few minutes observing the water to see if a fish shows itself before blindly throwing casts. Nothing can be more frustrating than fishing a location for a half hour only to find there isn’t a single fish present to be intrigued by our offerings. If finding fish is half the battle, the other half is fly selection. There are many anglers who will contend that an excellent presentation is far more important than the actual fly choice, and that’s almost always true. One of the times when it might not be is fishing for steelhead. The low and clear water mentioned above creates for some exciting sight fishing opportunities, and also a great chance to observe how the fish react to flies. Countless fish have watched well-presented flies drift within an inch of their nose only to shy away at the last moment. Then, after a quick fly change, that same fish will move several feet out of its holding lie to ferociously attack the new pattern. Eggs reign supreme and it’s advised to have a healthy selection of orange, pink, cream, and chartreuse in both single egg and sucker spawn patterns.